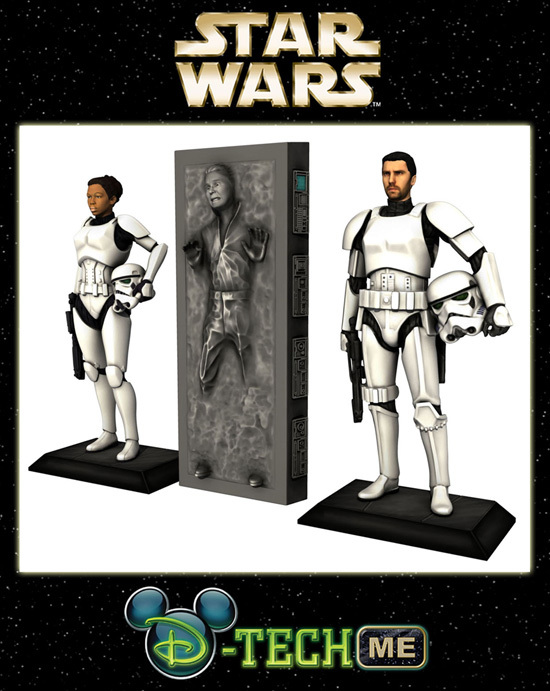 Disney just revealed that their Star Wars – D-Tech Me "Carbon Freeze Me" experience will return as well as expand by adding the option of making yourself into a Stormtrooper! According to Disney, the 10-minute experience uses the world’s highest-resolution, single-shot 3D face scanner created by our Imagineering scientists with Disney Research labs. That captured image is later sent to a high resolution 3D printer to create the figurine. The completed figurine will arrive within 7-8 weeks after the experience if shipping domestically (it takes a little longer if shipping internationally). Guests will also receive either a Carbon-Freeze Me light-up band or a collector button depending upon which option they choose. 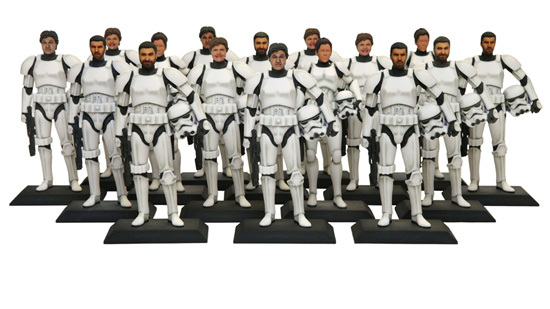 The Star Wars – D-Tech Me experience is $99.95, plus shipping and applicable sales tax. To book your experience, please call 407-WDW-TECH (407-939-8324) to ask about availability. We will only offer the experience during Star Wars Weekends 2013 (May 17 – 19, May 24 – 26, May 31 – June 2, and June 7 – 9). Please note: Separate theme park admission required for Disney’s Hollywood Studios. No discounts apply unless otherwise noted. Guests must be at least three (3) years of age to participate. A valid accepted credit card number is required at time of booking. No-shows or in the event a reservation is cancelled within 48 hours of scheduled experience will result in such credit card being charged a $25 cancellation fee. The experience, due to its personalized nature, is non-refundable and not eligible for an exchange. Children must be accompanied by an adult at least 18 years of age or older during the entire experience. Certain restrictions may apply. All prices, components and information are subject to change without notice. Sorcerer Radio's Kristen and Aljon pose for Disney's Star Wars Weekends promo video! Jedi Mouseketeer and the Sorcerer Radio Network will be covering Star Wars Weekends 2013!